It’s the weekend, yay! I’ve been plagued with pregnancy fatigue again this week so I haven’t had much energy to really do anything with my evenings. And that includes writing blog posts, so my backlog is kind of non-existent right now. But it’s the weekend and I don’t have any plans so I’ll be able to relax and write away! This is a polish that I wore back at the end of November. This is Etude House “Evening Black Sand” from their Dear My Nails line. I’ve always been a fan of Etude House‘s brushes and this one is no exception. I think wide and thin brushes are their standard because I can’t recall seeing any other brush types on their nail polishes. 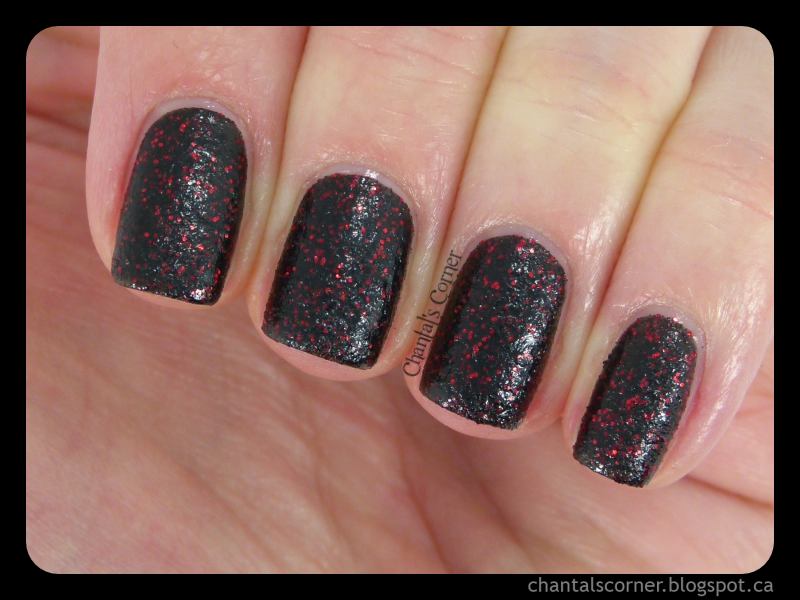 This nail polish is pretty self-explanatory when you look at it; it’s a black textured base with small bright red glitters in it. The first layer I applied was very thin and it dried really fast, but the second layer was a bit thicker and that one took forever to dry. From what I’ve read about textured polishes in general though this seems to be the norm. 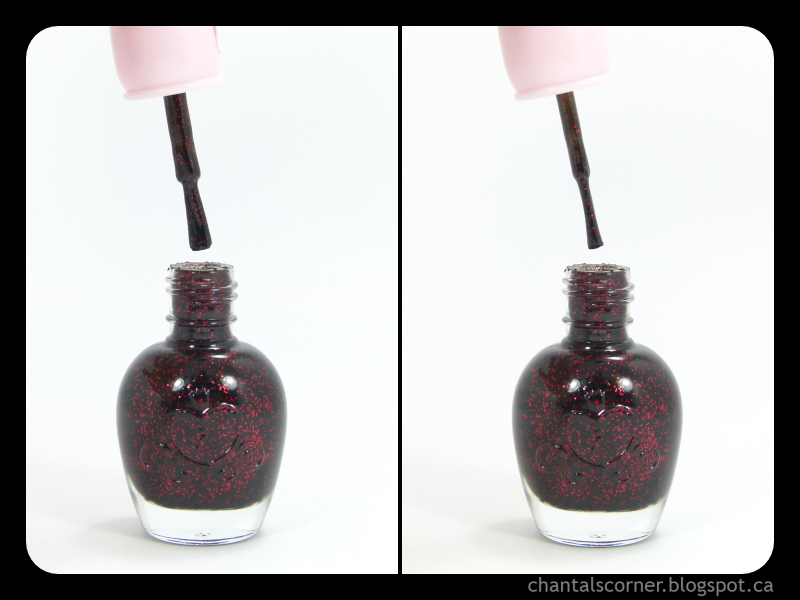 In these pictures I have 2 coats of polishes and no top coat, obviously! 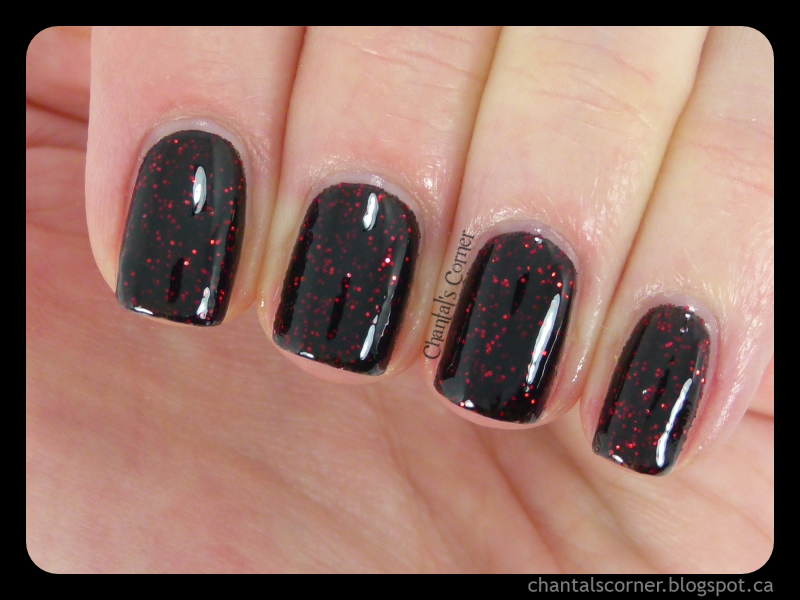 I have to say that I LOVE the red glitters in this one and I find it adds a great contrast to the black base. And here’s a macro shot. I’ve always love looking at swatches of textured polishes and I find it’s a really cool effect, but I’m not hooked on the trend for myself. If you’ve been following me for a while you know that I LOVE my smooth finishes and always go top coat crazy over glitter polishes, as in 3-4 coats, for that exact reason. So intentionally having texture on my nails just feels really odd to me. I still lust after textured polishes when I see swatches online cause some of them just look darn amazing! But I think it’s more the colours that draw me in as opposed to the textured effect. 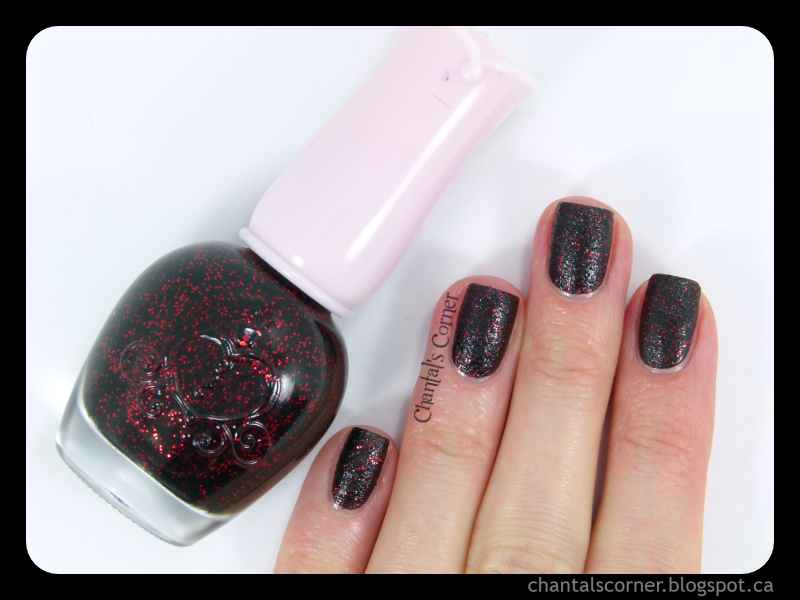 Before I end this post I just had to try this polish with a top coat to see how it would look, so check it out. Doesn’t it look amazing with top coat?!? I’m really glad I finally tried a textured polish! And even though I don’t like them on myself, I’ll definitely reuse this one with a top coat next time because I just love how it looks smoothed over. Have you tried textured polishes? What’s your take on them? I bought this for $2.10 USD (at 20% off) on RoseRoseShop. ← Baby Pink Stamping Because We’re Having a GIRL!